The Darling of Dublin Ken Doherty thrilled Killarney crowd on Day 2 of PTC8 (Alex Higgins International Trophy). Doherty won his all three matches today in deciders. Doherty won the first one against Joe Meara with classy century 125 in the decider. Second for Ken was Ali Carter who showed his form early in the match to lead 3-1 with 123. The pressure was on the Irish man but he managed to force a decider with a double respotted black. Somehow decider was very dramatic, Carter snookered himself when he needs a snooker to regain his victory. Ken recovered to beat Carter 4-3 and continued to delight his home fans with a 4-3 win over Rory McLeod in last 32. Well done Ken. First round meeting between Shaun Murphy and Steve Davis was also an exciting match which ended dramatically. Both tried maximum - Murphy ended at 105 but Davis was so unfortunate. Davis led 69-0 ahead of Murphy but 71 from Murphy overtook the frame to lead 3-2. More bad luck came for Davis in the sixth frame, Davis potted the final blue and pink and look alike to pull off a decider but he missed to cut the final black and left it over the pocket. Murphy won 4-2. However The Magician lost to Alan McManus in the last round today. 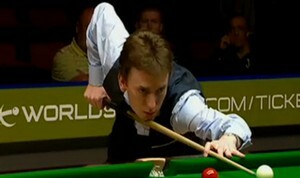 Judd Trump struggled in the morning but played extraordinary well at night. 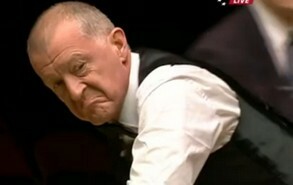 He smashed Marco Fu 4-0 in last 32. Fu only got 10 points in the match while Trump scored 335 out of four frames. Young talent Luca Brecel reached the last round of today before losing 2-4 to Stephen Lee. Yu Delu, Stuart Bingham, Mark Selby and Barry Hawkins are also through to Sunday's last 16.